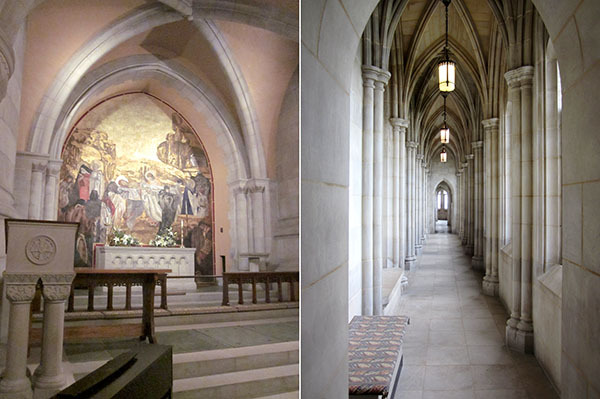 We started the day off with a journey to the Washington National Cathedral. And when I say a journey, I mean it. 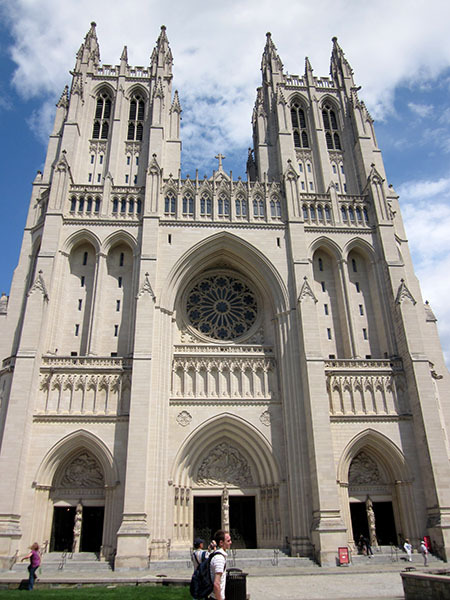 We took the Metro to Foggy Bottom and then took a bus to the cathedral. The traffic through Georgetown led to a painfully long bus ride, but we finall made it to the cathedral. Hey, you have to work for what you want to appreciate it, right? The cathedral (the 6th largest in the world) was (is) beautiful. Our tour guide was a bit dry, so we stealthily ditched it for a self-guided adventure. But not before our guide told us about this window. We all know Buzz Aldrin and Neil Armstrong, but there was a third astronaut who stayed in the spaceship while they made history, and he donated the moon rock to the cathedral. Moon rocks are cool. Inside the cathedral: In the basement and the 7th floor corridor. The view from the 7th floor. Why more people did not go up to the top is beyond me. But the big crowd pleasers are the gargoyles. 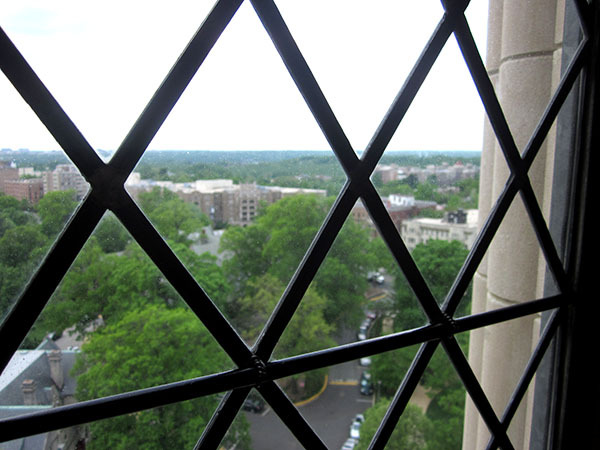 You can take a special gargoyle tour on Saturdays (I think) so we had to do it ourselves. 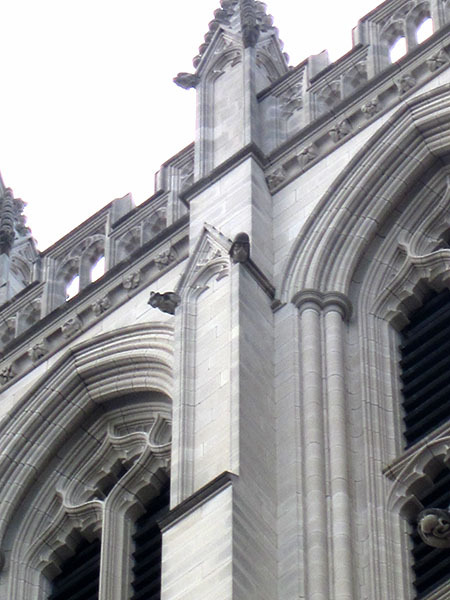 But really, we just wanted to see one gargoyle in particular. 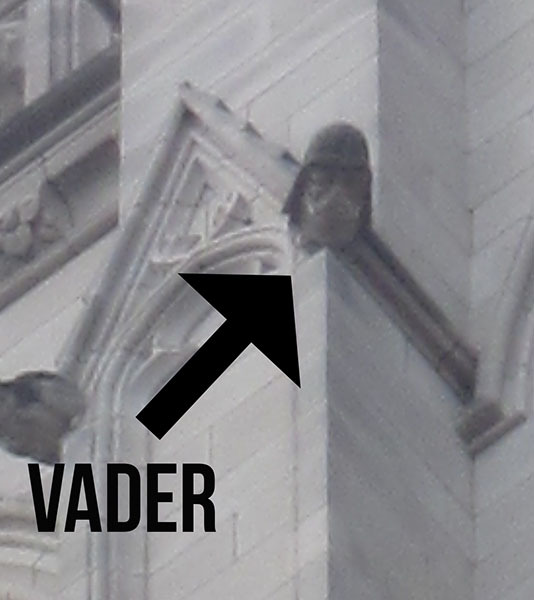 A perfect addition to any cathedral. Not being a huge Star Wars fan, I love seeing pop culture mixed in with religious tradition. 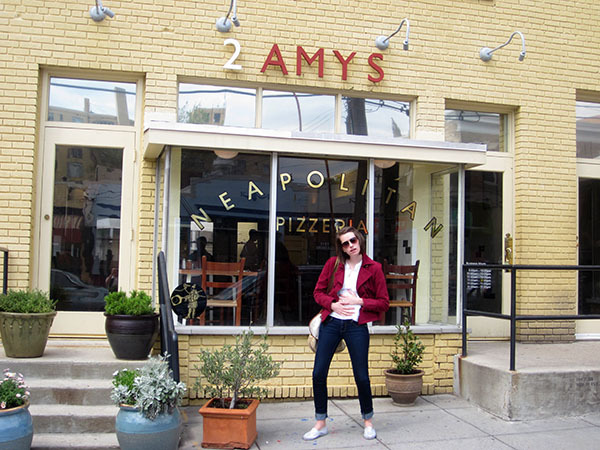 We had lunch at 2 Amys Pizza a few blocks north of the cathedral. This was my after shot. No, really. 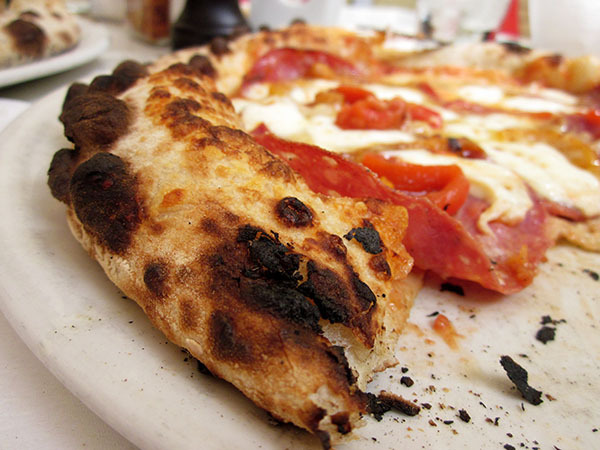 This pizza was really good. And I ate the whole thing and still felt great after. 2 Amys: COME TO UTAH!!!! We took the bus back to Georgetown. 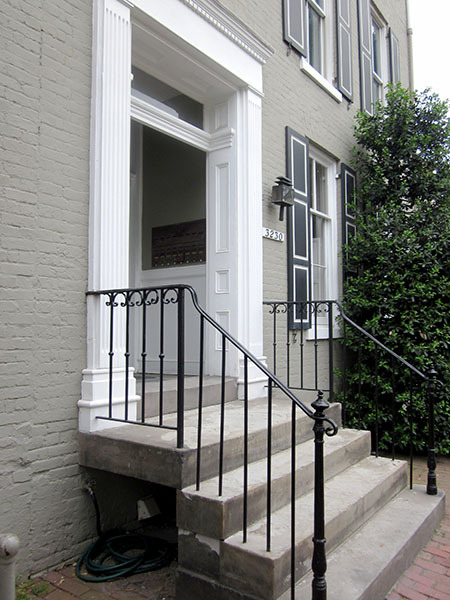 Georgetown is my kind of place. In my mind I pretend I live here. After daydreaming through the overpriced brick stone houses, we headed back down to Financial Triangle for our twilight bike tour. This is what I consider the best money we spent on the trip. 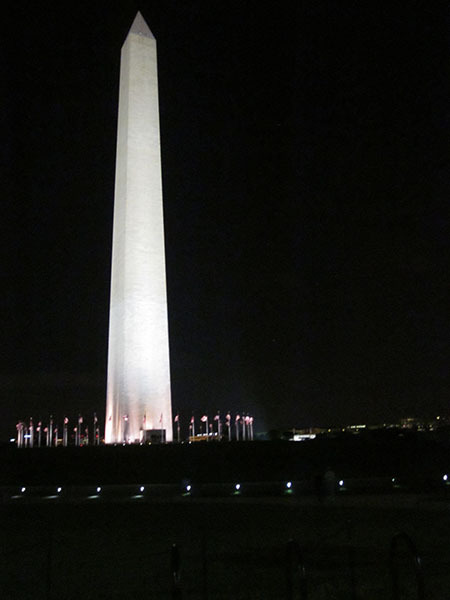 It is a guided bike tour through all of the monuments at night. Watching the sunset on the landmarks in D.C. was breathtaking. And with the monuments being so far away from each other, it was a great way to see all of the sites and minimize the walking time in between. Our tour guide was perfect: she gave just enough background about the monuments to make it interesting and she watched our bikes while we went up into some of the monuments. Perfect. The only downside was that we had to wear these dorky vests the entire time. Safety first, people. 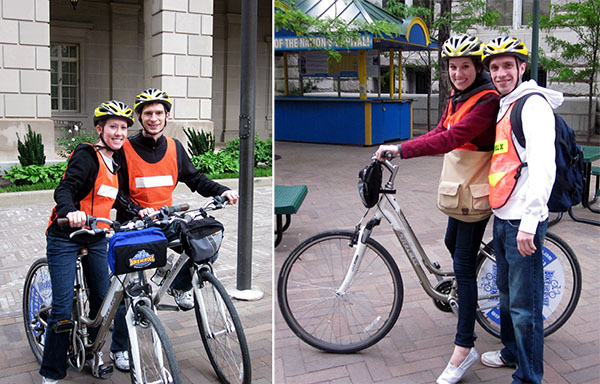 We were lucky enough to have Matthew and Kim join us for the bike tour. Kim had not ridden a bike in years but we convinced her that riding a bike is, well, just like riding a bike. And I was the one that had my chain fall off my bike when I did an accidental front wheelie, so who is laughing now? Our next stop after the Washington Monument was the World War I Memorial. 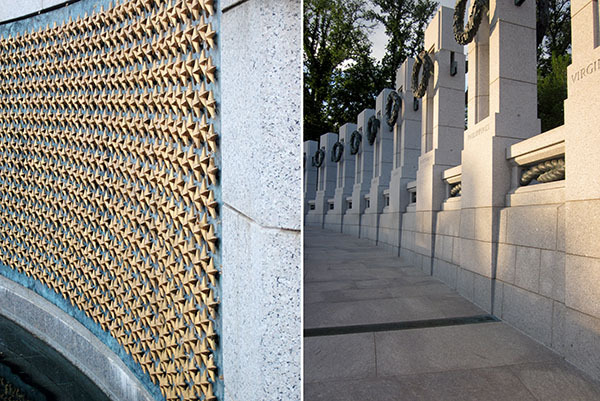 The wall of gold stars represents the fallen soldiers. And the columns represent each state that was involved in the war, including the Virgin Islands and the Philippines among others. Our next stop was a visit to Albert Einstein at the National Academy of Sciences. They say to rub his nose for good luck. Always in need of luck, we all took our turn. Strangeness seems to find or follow us wherever we go. And it manifested itself at the Albert Einstein statue with a man in white tights doing back bends off of a park bench. Full on Ben Stiller in 'Heavyweights'. Nice. We then pedaled our way over to the Vietnam Memorial, one that I have been anxious to see. I love the story about Maya Lin, the designer of this memorial. The memorial is cut into the earth, so the further you walk down into it, the bigger the stone gets. It really adds to the emotional feeling of the memorial. 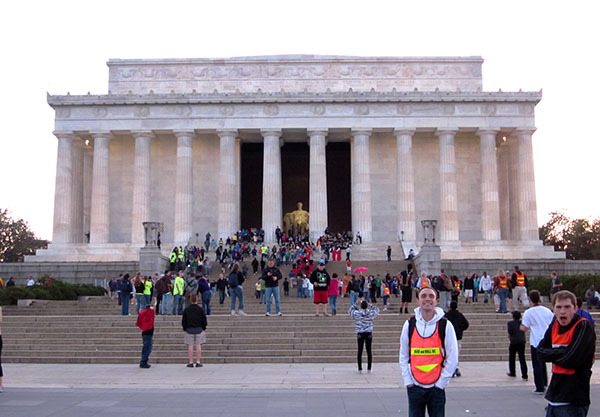 The Lincoln Memorial was next and was by far the most crowded. There were hoards of people there- it was really difficult to ride our bikes through them. Especially through the crowds of middle schoolers trying to high five us. Because that is normal to do to bike riders. Us with the big man. And he really is big, but not as big as he appears. From his feet up, he is 19 feet tall. 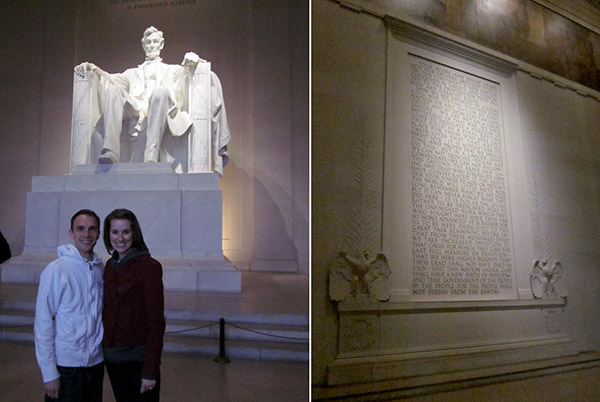 One of Lincoln's speeches etched on the wall. There is a typo on the other wall of etchings, but we didn't have enough time to find it, which kills me because I love finding typos. Next we went through the Franklin Delano Roosevelt Memorial. This was probably my favorite. It is a whole outdoor complex divided into four areas, one for each term he served as president. The walls were etched with his most powerful quotes and the waterfalls gave it a really unique feel. 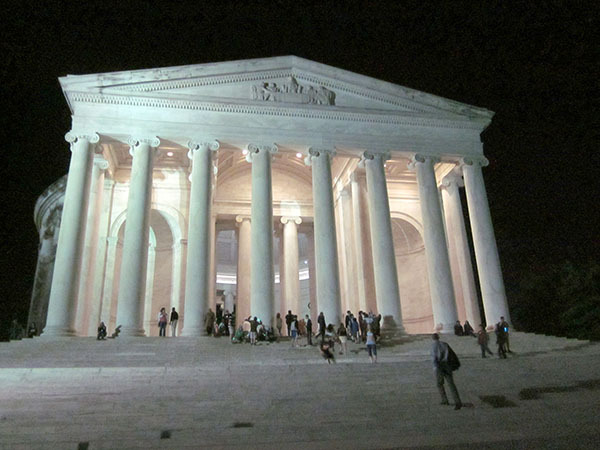 Our last stop was the Jefferson Memorial. 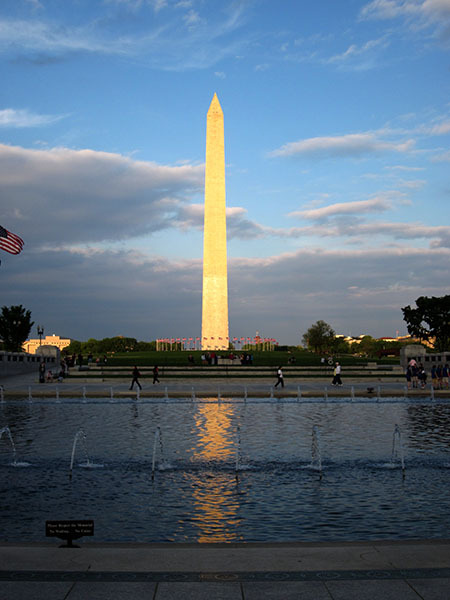 Another example of the beautiful architecture of the monuments in D.C.
Phew. After 3-4 miles, we finished our tour. Seriously, people. This is a must do in D.C.